B.C. 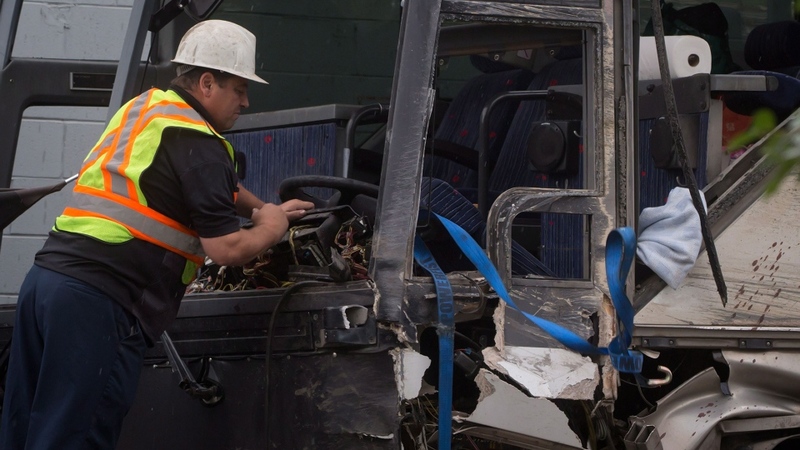 RCMP said speed was likely not a factor in a bus crash on a stretch of Coquihalla Highway that injured dozens of passengers and left seven in critical condition. Investigators have yet to determine what caused the single-vehicle collision, but said Friday that dash cam footage from a tractor trailer travelling behind the bus has led them to rule out speed as a possible cause. Police said they’re now inspecting the bus for any possible mechanical factors, such as steering or braking problems. 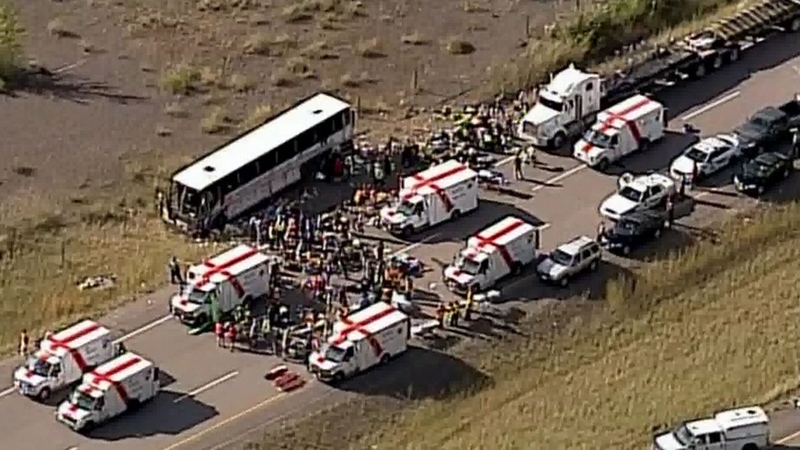 Dramatic aerial footage of the crash scene, located about 30 kilometres southwest of Merritt, showed lines of ambulances parked on the ground, and several first responders attending to the injured passengers. RCMP Sgt. 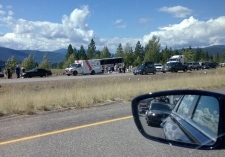 Norm Flemming said a total of 56 people were aboard the bus, which was travelling from the Okanagan to the Lower Mainland. "We don't have any fatalities listed yet, and we're just crossing our fingers and hoping for the best on that one," Flemming said. The crash prompted the regional health authority to call a "code orange” at three local hospitals. A “code orange” is used to alert hospital staff of a disaster or mass casualty incident. Michaela Swan of the Interior Health Authority said Friday those hospitals provided care for 43 patients. In addition to the seven in critical condition, six are in serious condition, 11 remain in hospital with non-life-threatening injuries and 19 have been released from hospital. A dozen other patients were treated at a Lower Mainland hospital. "What happened yesterday was truly a tragic incident and we certainly understand that there are families around the world waiting to hear about the conditions of their loved ones," Swan told reporters. "It was truly an all-hands-on-deck health-care response." Swan couldn't speak to specific injuries, but said they treated everything from bumps and bruises to broken bones and head injuries. Police received a call about the crash at about 3 p.m. local time Thursday afternoon. The crash prompted a massive response from first responders, involving at least 18 ambulances and six helicopters. The highway was closed in both directions for several hours. The RCMP said there were several civilians who stopped their vehicles to help the injured. Terry Lipfin, an off-duty firefighter, told CTV Vancouver that the scene was "horrifying." 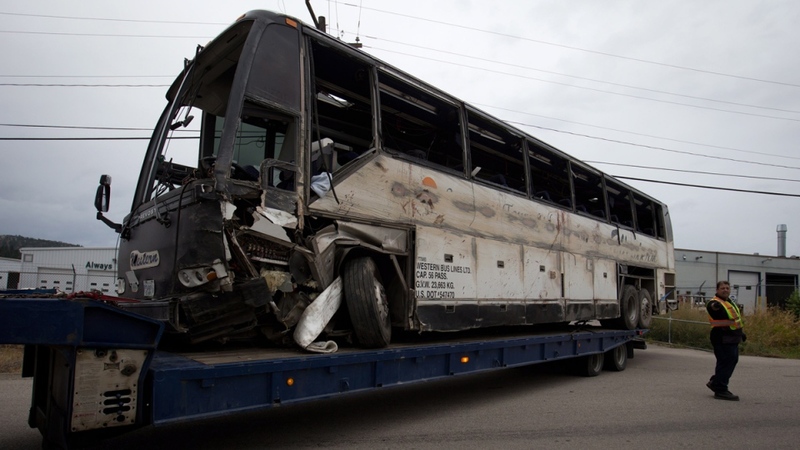 "There was a bunch of people already lying on the ground; the bus was actually still bouncing. There were people trying to climb out of the windows," Lipfin said. "It was horrifying… it was a mess." Cynthia Schneider also stopped to help. "I got here a few minutes after the accident, so I just pulled over and grabbed my blanket and phone and ran up," she said. "There were people lying around everywhere." Police are investigating what caused the crash, which involved only the bus. One witness told CTV Vancouver that she and her boyfriend were travelling on the highway in the same direction when the bus passed them. "We were doing 130 (kilometres per hour), that's when the bus passed us," Kat Woycechowsky said. The Richmond-based Super Vacation was using the bus to take a group of tourists on a tour of the Rockies. The bus was chartered through Western Bus Lines, based out of Kelowna. Representatives from the tour company spoke Friday and said they have used the bus company before, but did not have any information on the bus or the driver. The RCMP said passengers were from Canada, the United States and China. Two were aboard the bus as translators. 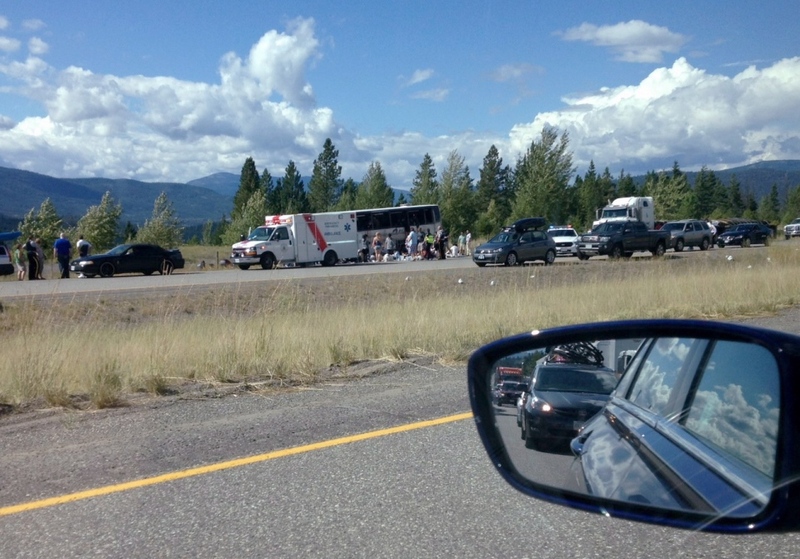 Paramedics are on scene following a tour bus crash on the Coquihalla Highway southwest of Merritt, Thurs., Aug. 28, 2014.